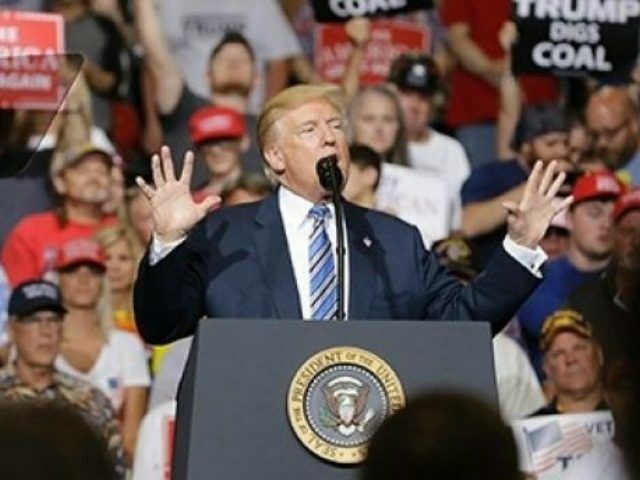 President Donald Trump will hold a rally in West Virginia tonight for GOP Senate candidate Patrick Morrisey hours after Trump’s former lawyer Michael Cohen agreed to a plea deal after being charged with eight counts and Paul Manafort, Trump’s former campaign chair, was convicted on eight counts, including bank and tax fraud. In addition, Trump will stump for Morrisey after news broke about an illegal alien who was charged with the murder of Iowa college student Mollie Tibbetts, who had been missing since July 18. Stay tuned to Breitbart News for live updates of Trump’s West Virginia rally. All times eastern. 8:17 PM: Trump says Kavanaugh straight out of “central casting” and wonders how anybody can vote against him. Trump continues to call Trudeau "Justin" as intentional diminutive, as an aide once said, during his W Va rally. 7:52 PM: Trump says border security “the beating heart” of the midterm elections. Trump says “we have MS-13 on the run because we love the men and women of ICE.” Trump says a “blue wave” means open borders and crime and releasing predators who will be preying on our communities. Trump mentions that ICE got a Nazi criminal deported while Democrats are calling for ICE to be abolished. Trump says to vote for Republicans “if you want to stop the craziness” of sanctuary cities and then blasts Chicago Mayor Rahm Emanuel and mentions that another 60+ were shot in Chicago last weekend. Trump also says the election will be about jobs and touts the 4 million new jobs created since the election + 4.1% growth. 7:45 PM: “Should’ve never happened,” Trump says of Mollie Tibbetts’s murder. Trump says the immigration laws are a “disgrace” and “we’re getting them changed.” He says he needs more Republicans to get the disgraceful laws changed. 7:41 PM: Trump says he doesn’t see blue wave happening because of the great economy. He blasts Manchin for not voting with Trump on tax cuts, the wall, the travel ban, and judges. 7:40 PM: Trump says Democrats “want to turn America into one big, fat sanctuary city for criminal aliens.” He says Democrats are more protective of criminal aliens than citizens and want to take away your Second Amendment. Trump says Democrats also want to take over healthcare and the courts to rewrite the Constitution. 7:34 PM: Trump says a vote for Manchin is a vote for Democrats like Schumer, Pelosi, and Waters who “don’t even know West Virginia exists.” Trump says West Virginians need to vote so Republicans can control the House and the Senate. 7:29 PM: Morrisey says West Virginians need to send someone like him to Washington to drain the swamp and starts attacking “dishonest liberal Joe Manchin,” who supported Hillary Clinton after she said “we’re going to put a lot of coal miners and coal companies out of work.” He says Manchin doesn’t have West Virginia values and blasts him for not supporting the tax cuts and shilling for EpiPen. 7:26 PM: Trump calls Morrisey a “tremendous gentleman” even though it “took a little while” to figure him out. He says Morrisey will fight for West Virginia “like nobody has ever fought” for the state. 7:17 PM: Trump says “unlike the NFL,” West Virginians honor and cherish the flag. He mentions that ESPN just won’t broadcast the anthem instead of defending the flag. Crowd booos. 7:15 PM: Trump appears on stage at the Charleston Civic Center. He says he’s thrilled to be back and mentions that he won by 42 points over Hillary Clinton in 2016. He says West Virginians are loyal, hardworking, true American patriots. Lara Trump on stage at #MAGA rally: “when I hear this nonsense about #Russian collusion, it makes me very angry.” Tells Trump supporters that the “collusion” conspiracy is just the Democrats and ‘The Media’ telling them their vote doesn’t matter.